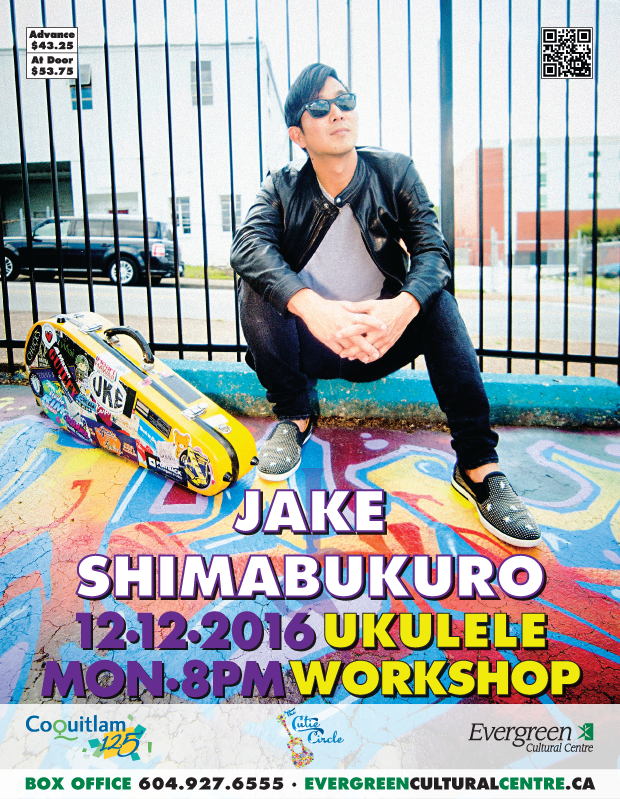 We are over the moon to announce that Jake Shimabukuro, the international ukulele superstar, will be visiting from Hawai’i to give a rare workshop aimed at inspiring ukulele players of all ages and levels on Monday, December 12 in Coquitlam. We are also very proud that this workshop has been designated as a Coquitlam 125 sanctioned event in celebration of the City’s 125 years for the cultural legacy it will bring to residents in the region. What’s more? Translink’s Evergreen Extension will open just in time for ukulele players in Metro Vancouver and Fraser Valley to arrive by Skytrain at the terminus station immediately adjacent to the Evergreen Cultural Centre. Tom Lee Music Canada is offering 10% off ukuleles and print music to participants of the workshop for the month of December. Be sure to save your workshop tickets. Considered one of the world’s most influential ukulele players of all time, Jake will be sharing his expert knowledge and talents on the tiny instrument that has touched the hearts of millions around the globe. This workshop will prove to be a breathtaking event that will give participants a glimpse of the amazing magic one can perform with the approachable and adorable ukulele. Advance tickets went on sale at 10am on Sunday, October 23. Get your tickets early for best seat selection! Jake Shimabukuro can still vividly remember the first time he held a ukulele, at age four. It was an encounter that would shape his destiny and give the world one of the most exceptional and innovative uke players in the history of the instrument — an artist who has drawn comparisons to musical titans such as Jimi Hendrix and Miles Davis. Of course, Shimabukuro would end up performing on many of the world’s most renowned stages. Starting his career in Hawai’i, he took his inspiration from some of the islands’ great uke players — Eddie Kamae, Ohta-San and Peter Moon. But he quickly expanded his scope from there, drawing influences from across the musical spectrum. Shimabukuro’s busy touring schedule — 140 dates a year — is complemented by a rich and varied catalog of albums that capture the many moods of the uke. His most recent CD, Nashville Sessions, is one of his most adventurous, multifaceted and engaging records to date, blending elements of jazz virtuosity with heartfelt melodicism. A husband and father of two, Jake balances his stellar career with family life and community service. He travels to schools around the world spreading positive messages to young people, encouraging them to live drug free and find their passion — just as he did at age four when his mother gave him his first ukulele lesson. In the time since then, he has played a key role in the current revival of interest in the ukulele. Tickets are also available through the Box Office by phone at 604.927.6555 or in person at the Evergreen Cultural Centre. Participants may bring their ukuleles to the workshop. Thank you for the tremendous enthusiasm and support! Visit Evergreen Cultural Centre’s Find Us page. This entry was posted in Events, Posts and tagged ウクレレ, Coquitlam, 烏克麗麗, Evergreen Cultural Centre, 高貴林, Jake Shimabukuro, legend, Ukulele, Workshop, 尤克里里, 乌克丽丽 on October 21, 2016 by cutiecircle.